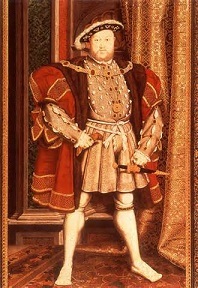 Henry VIII (1491-1547) - The monarch who provides us with perhaps more comic relief than any other, Henry VIII is notorious for his six marriages. Two of his wives he beheaded, two he divorced, one he out-lived and the last one out-lived him. As the son of Henry VII, he was a little bit lucky ever to become king. His father is the monarch who defeated Richard III to end the Wars of the Roses, and his mother was Elizabeth of York (daughter of King Edward IV). Even so, he was not the first in line to inherit the throne. His older brother, Arthur was. But Arthur died in 1502 of an unknown ailment, five months after his marriage to Catherine of Aragon. Because he was not expected to become king, almost nothing is recorded of Henry's childhood by the royal scribes. He did become king though in 1509, after his father died. A month later, he married his brother's widow, Catherine. Catherine was the daughter of the powerful Spanish monarchs, Isabella and Ferdinand (see below). Henry wasted little time asserting his authority. Two days after his coronation, he arrested two of his father's ministers, Edmund Dudley and Richard Empson for treason. They were executed a year later. Execution would become one of Henry's favorite hobbies. His martial troubles stemmed from his wives' difficulties in producing for him a male heir. Catherine did bear a son, Henry, on New Year's Day, 1511; but he died after only seven weeks. Two of her pregnancies resulted in miscarriages. The marriage did produce one child, Mary, who survived to adulthood. She would become Queen of England for five years, a reign of terror for Protestants. By 1525, Catherine was approaching 40 years of age and was unlikely to have any more children. Henry became troubled he would not have a male heir. One of Catherine's attendants was a young lady named Anne Boleyn. The king devised a plan by which he would have his marriage to Catherine annulled based on her previous marriage to his brother Arthur, and marry Anne. The plan led to all kinds of problems with the Pope and the Catholic Church, which resulted in the English Reformation. Henry broke with Rome and became head of the Church of England. This freed him up (in his mind) to divorce Catherine and marry Anne Boleyn, which he did in 1533. Anne became pregnant immediately and gave birth to Elizabeth in September of that year. But Anne quickly fell out of the king's favor because she was considered very independent. Her second pregnancy ended in a miscarriage and Henry began making plans to leave her for the same reason he left Catherine. Several officials of the Church (of England) opposed this and Henry response was to execute them. However, an annulment was not a realistic possibility since Anne had not been married before. So Henry had her executed on a trumped up charge of adultery in 1536. Soon after he married Jane Seymour. She bore him a son, Edward, in October 1537, but she died as a result of the childbirth (and Edward died at the age of only 15, but was king for five and a half years). His next marriage was to Anne of Cleaves. That one lasted about six months and ended in divorce. In 1540, he married Kathryn Howard. She was his second wife to be executed, this time for legitimate adultery. Henry married his final wife, Katherine Parr, in 1543. By this time his health had begun to decline and he became obese. He died in 1547 suffering from a number of different maladies.